At the annual Offshore Energy Center gala on 20 September, IADC was recognized with an election to the Offshore Energy Center Hall of Fame as a Technology Pioneer. IADC was awarded the honor in the category of Health Safety and Environment for work on API Recommended Practice 75. Additionally, Alan Spackman, IADC Vice President, Policy, Government and Regulatory Affairs, was individually recognized as a Technology Pioneer in the same category. The awards, presented annually, recognize innovations that stand out in the development of the offshore industry and its resources. IADC previously received the award in 2013 for the development of the HSE Case Guidelines and in 2003 for the development of offshore safety programs, including the Rig Safety Recognition Program and the Rig Pass and WellCAP training programs. Stand-alone, information-packed chapters of the 12th edition of the definitive rig operations manual, the IADC Drilling Manual, are now available in electronic form. More than 100 technical experts contributed to the first major rewrite of the manual in 22 years. “The updated IADC Drilling Manual is a major deliverable of IADC and represents thousands of hours of work by a dedicated group of renowned industry experts. The new and updated content reflects the latest technologies developed over the last 22 years,” said Mike Killalea, IADC Group Vice President/Publisher. More titles will be available in the coming months. The eBooks are compatible with most eReaders, including DL Reader (mobile devices), BlueFire, Adobe Digital Editions and more. On 3 September, the Commission requested the European Committee for Standardisation (CEN) and the European Committee for Electrotechnical Standardisation (Cenelec) draw up new harmonized standards for machinery. The group will work within the meaning of Article 2 (a) of Directive 2006/42/EC on Machinery. Where appropriate, they will amend existing European standards in order to ensure better availability of harmonized standards for machinery used in the drilling and well intervention operations in the offshore oil and gas industry. They are also tasked with determining which standards can be used to support the application of essential health and safety requirements of the Directive 2006/42/EC. The relevant European standardization organizations are requested to deliver, within 49 months, harmonized standards which cover the safety-critical machinery as listed in the requested work programme. The Commission has also requested the development of a harmonized standard dealing with the safety of integrated systems (assemblies of machinery) used in offshore drilling processes. The work program includes hoisting and rotary systems; pipe handling systems; BOP handling equipment; specialized lifting equipment; elevators and safety of integrated systems. On 5 September, IADC filed a letter in response to the US Coast Guard’s 14 April 2014 Advance Notice of Proposed Rulemaking, proposing the expansion of the maritime safety training requirements to cover “all persons other than crew” working on Offshore Supply Vessels and Mobile Offshore Units engaged in activities in the US Outer Continental Shelf. IADC’s letter offered general comments, while also stressing the importance of comments submitted by individual IADC member companies. Full contents of the letter can be accessed on IADC’s website. On 14 August, the European Commission published a study on civil liability for offshore accidents in Europe. The study looked at how liability and compensation for bodily injury, property damage and economic loss are handled. It also addresses financial security instruments to cover such damage. The study is part of a Commission fact-finding exercise on the subject under the Offshore Safety Directive and not linked to any future legislative process. On 17 September IADC participated in a roundtable discussion, hosted by the European Commission, to discuss the study’s findings. Click the link to access the full contents of the European Commission study. The US Department of Energy (DOE) recently announced the availability of the draft document, Energy Sector Cybersecurity Framework Implementation Guidance. The DOE is also seeking public comment on the document. The Guidance is a product of a collaborative effort with the Electricity Subsector Coordinating Council and the Oil & Natural Gas Subsector Coordinating Council. The DOE has indicated that is has also coordinated with other Sector Specific Agency representatives and interested government stakeholders for the development of the draft Guidance and to address cross-sector overlaps. The goal of the document is to help energy sector stakeholders develop or align existing cybersecurity risk management programs to meet the objectives of the Cybersecurity framework. The document, available until 14 October for comment, is available via the Department of Energy website. The US Department of Labor’s Occupational Safety and Health Administration recently announced a Final Rule requiring employers to notify OSHA when an employee is killed on the job or suffers a work-related hospitalization, amputation or loss of an eye. The rule, which updates the list of employers partially exempt from OSHA record-keeping requirements, will go into effect on 1 January, 2015, for all workplaces under federal OSHA jurisdiction. All employers covered by the Occupational Safety and Health Act, even those who are exempt from maintaining injury and illness records, are required to comply with OSHA’s new severe injury and illness reporting requirements. OSHA is developing a Web portal for employers to report incidents electronically, in addition to the phone reporting options. The US Bureau of Labor Statistics (BLS) recently reported preliminary results from the 2013 National Census of Fatal Occupational Injuries. Mining, quarrying and oil and gas extraction had the third highest fatal work injury rate at 12.3 per 100k FTE. The preliminary number of fatalities in oil and gas extraction, which has been a particular area of concern for OSHA, declined nearly 19 percent from 2012’s preliminary level. For more information, including further census details, please visit the Bureau of Labor Statistics website. On 18 September, the US Court of Appeals for the Fifth Circuit held that a dynamically positioned semi-submersible is a stationary source. The ruling means that the Chemical Safety Board, not the National Transportation Safety Board, had jurisdiction to investigate any emissions into the air from the Deepwater Horizon. On 9 September, the API Recommended Practice 75 workgroup met for the first time since August 2013 to update the Recommended Practice in light of the completion of the first round of BSEE SEMS audits. IADC members are encouraged to participate in the revision process. Please contact Julia Swindle for more information at Julia.Swindle@iadc.org. On 11 September, IADC staff members had the opportunity to tour several H&P facilities in Midland. Stephen Colville, President and CEO, Rhett Winter, Director, Onshore Operations and Bob Warren, Vice President, Onshore Division, toured the H&P yard and warehouse facility, from which a new Flex-Rig is completed and mobilized per week. They were also treated to an orientation of the H&P worldwide system for safety alerts, JSA’s and communications. Concluding the visit, the group toured Rig 605, getting a first hand look at operations. 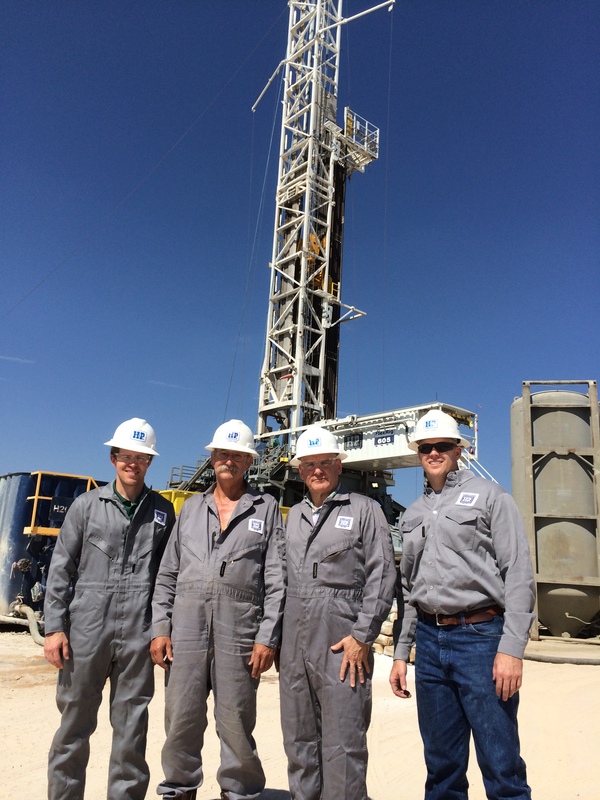 IADC staff tours H&P Rig 605. 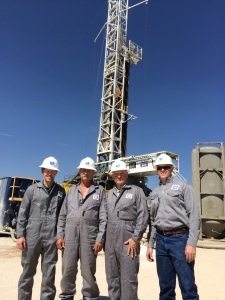 Pictured Left to Right: Rhett Winter, IADC Director, Onshore Operations; Robert Jolly, Rig Manager, H&P Rig 605; Stephen Colville, IADC President and CEO; Mike Lennox H&P District Manager – West Texas. The International Association of Drilling Contractors (IADC), recently underwent internal organizational structure changes. Mark Denkowski was named Executive Vice President, Operational Integrity; Steve Kropla, Vice President, Offshore Division; Bob Warren, Vice President, Onshore Division and Alan Spackman, Vice President, Policy, Government and Regulatory Affairs. “IADC is an evolving organization. As the industry grows and changes, so to do the needs of our members. Our internal structural changes are reflective of our efforts to consistently meet these needs and deliver optimum value to our membership while working to achieve IADC’s mission of catalyzing improved performance for the drilling industry,” said Stephen Colville, IADC President and CEO. In his new role, Mark Denkowski will oversee the association’s Onshore, Offshore, Drilling & Well Servicing and Quality Assurance/Quality Control Divisions, along with retaining oversight of the Accreditation and Credentialing Division. He has more than 30 years of experience in the oil and gas industry, both onshore and offshore, working in Southeast Asia, the Middle East and West Africa. Before formally joining IADC, Mr. Denkowski was active within the association as a member of the Training Committee and Chairman of the IADC Competency Assurance Panel. He has a BS degree in Earth and Mineral Science from Pennsylvania State University. Steve Kropla will oversee the activities of IADC’s offshore division in his new role. He joined IADC in 1992 and is the association’s representative on the Center for Offshore Safety’s Governing Board and a member of the International Association of Oil & Gas Producers’ Wells Expert Committee. He holds a BS degree in journalism from Southern Illinois University and an MS in human resources management and development from Chapman University in Orange, California. Alan Spackman joined IADC after retiring from the US Coast Guard, where he held the rank of Commander. He received a master’s degree in naval architecture and marine engineering from the University of Michigan and a Bachelor of Science from the United States Coast Guard Academy.